St. Louis has long-since been a destination for explorers; Lewis and Clark departed from this very spot back in 1804. Modern STL is home to top-rated universities, sports arenas, and a breadth of outdoor activities. 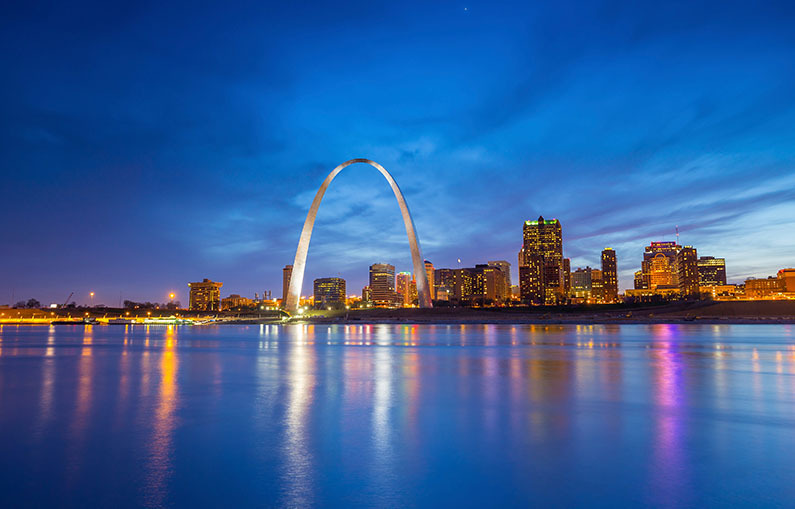 The city’s history tells a story: St. Louis is the Gateway to the West. A modern and inventive interpretation of a “hands-on” museum, St. Louis’ City Museum brings out the kid in all of us. Step into the museum and let your imagination run wild: to the creative eye, this space crafted mostly from repurposed objects is a daydream set ablaze. With exhibits like The Enchanted Caves and Shoe Shaft (a hand-sculpted cave system/spiral shaft once used to transport shoes) and The Shoelace Factory (where visitors can order their own custom shoelaces), this eclectic design makes the City Museum a can’t-miss destination in STL. Constructed in a Greek-Revival style architecture, the Old St. Louis County Courthouse sits at the base of the St. Louis Arch. Most notably the site of the historic Dred Scott trial, the courthouse hosted countless freedom-related trials throughout history. Inside, visitors can explore two of the original courtrooms and gain insight into the St. Louis of days past, with the modernized arch (and STL’s most recognizable landmark) just steps away. Kids (and kids at heart) in St. Louis can be found frolicking at Turtle Playground, a park made up entirely of freestanding concrete turtle sculptures. In an Instagram-worthy display, these mammoth reptiles lounge in the backyard of St. Louis’ busy downtown. Be sure to snap a photo or two, or even pack a lunch: the playground’s unique design makes it a fun place to spend an afternoon (and who wouldn’t want to eat a sandwich upon a giant turtle’s back?). The symbol of St. Louis’ spirit of connection, the Gateway Arch has been a photographic wonder since 1965. In modern STL, visitors can travel to the top of the arch (630 feet high) via an enclosed tram. Whether you’re taking selfies at the foot of history or gawking at the incredible views (of downtown, the Mississippi River, and much more), the Arch provides the quintessential STL experience: an exploration of America’s unturned paths. To plan your trip to St. Louis or for an extended guide of things to do, visit the official St. Louis city guide at https://www.stlouis-mo.gov.